We arrived on Monday afternoon and dug our anchor in on the east side of the port, just clear of the fishing harbour. There were no other yachts there - or even local boats on moorings. After locking up we rowed ashore and left the dinghy in the care of a 'helper' at the fuel station - just north of the port gates where the immigration office is. We had to wait for the immigration official, so we passed some time over cold beers in the cafeteria in the brand new passenger terminal. When the official arrived he spoke good English and soon provided Helen with a visa - necessary for her to be able to fly home. Next stop was the Maritime Police office on the west side of the port - a long way round so we took a taxi. They spoke little English but after processing the paperwork made it clear they wanted us to move Lynn Rival further west - for better 'security'. After a quick recce in the town centre (on the plateau), we got a taxi back to the fuel station and were relieved to find the dinghy still there, reluctantly paying the hefty 1000 escudos (£8) our helper demanded. Had we had better command of the lingo we might have been able to negotiate a better price? As requested we moved to the west side - in line with the derelict jetty in front of the Maritime Police office - and spent two very comfortable nights there. The winds were moderate and steady enough to hold us in position with no rolling at all. On Tuesday we rowed ashore and padlocked the dinghy to one of the piers of the derelict jetty, within sight of the Maritime Police office. 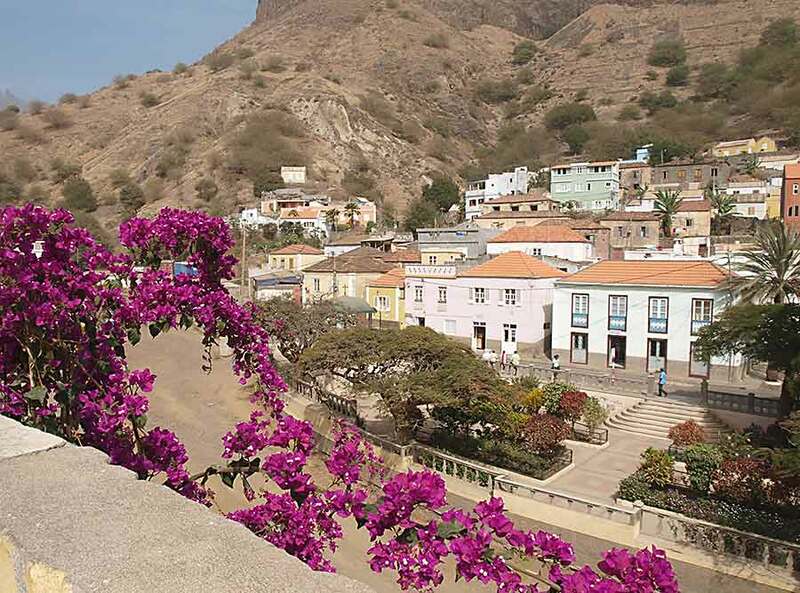 Praia is fast-growing and sprawling. 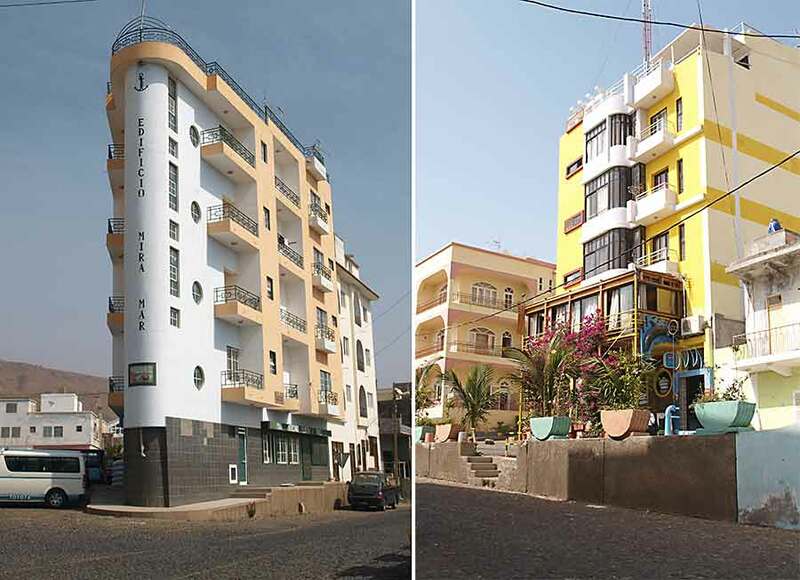 Like all Cape Verdean towns and villages we've seen so far there's a lot of building 'going on' with half-built blockwork structures detracting from the often brightly-painted finished buildings, old and new. 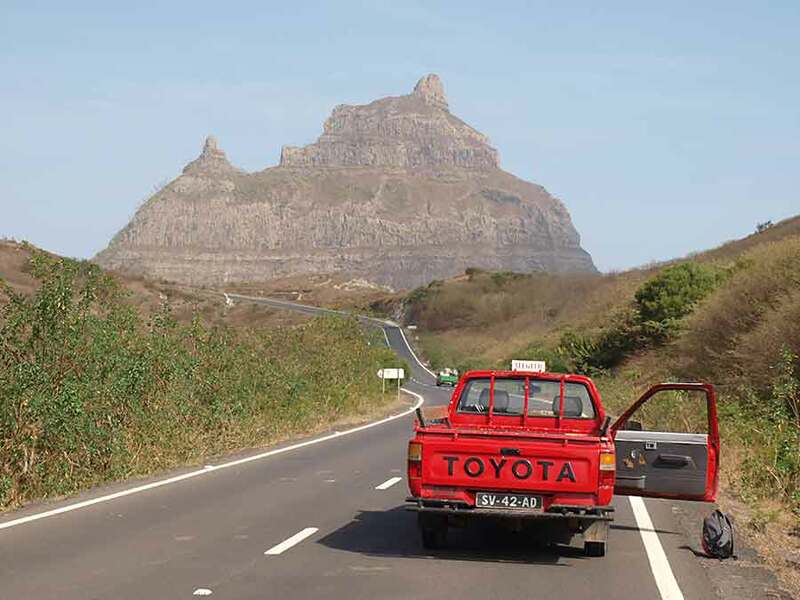 In Praia, the road around the port is a race-track with no inviting bars or restaurants so we concentrated on exploring the plateau (plato as the locals spell it). We couldn't find any tourist information in English so settled for ambling around the wide, cobbled streets to admire the old buildings, leafy squares and views of the harbour. We did find the Ethnographic museum - a collection of tools, equipment and other artifacts produced and used by the islanders until recently but increasingly replaced by modern methods and equipment. Sadly the cathedral was closed so we didn't see the interior . . .
We needed to stock up so we visited the produce market which is jam-packed with women selling fruit and vegetables. The few men present were limited to selling fish from buckets. 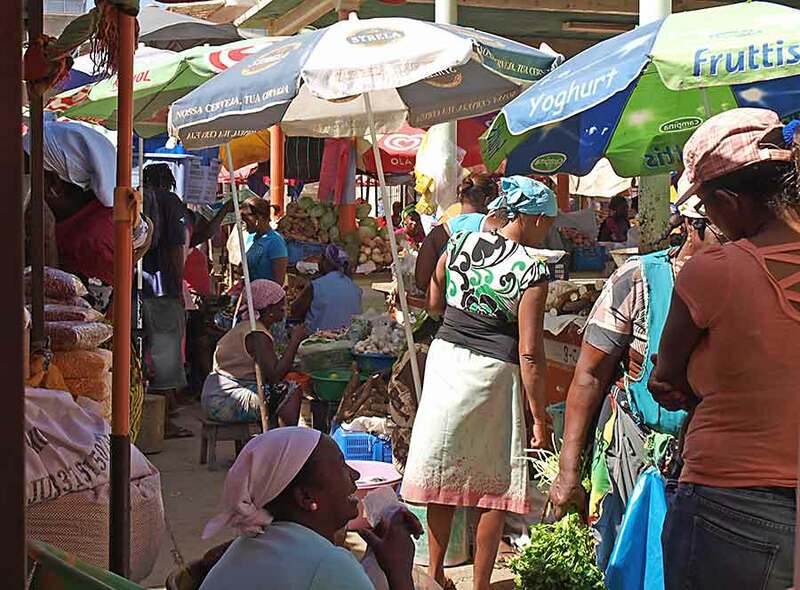 It was early afternoon so the market was quiet and the sellers all very good-humoured as we trundled around searching for the nicest bananas, tomatoes and green beans. The range of produce on offer and the quality were very good. We also found a helpful butcher in one corner who had a wide range of fresh meat for sale. All too soon it was time for Helen to leave us and on Tuesday evening Paul went with her to the airport - just a short taxi ride out of town. The next morning we weighed anchor and left as well. We were tempted to stay a bit longer and do a tour of Santiago island but the weather forecast was favourable for making our passage back north. 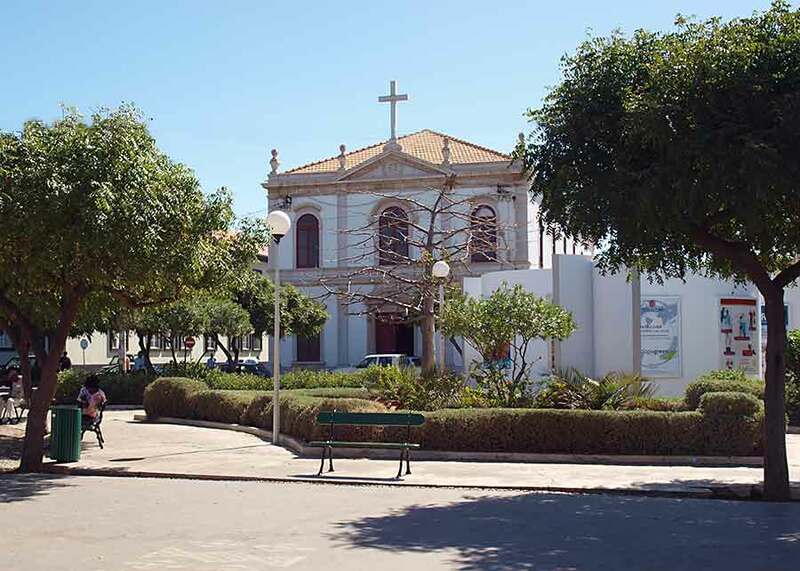 We'd already decided to head back to Mindelo for carnival - and hoped to see one or two more islands on the way. As we left Praia we saw that a cruise ship had come into the port overnight so it was probably best to be on our way. 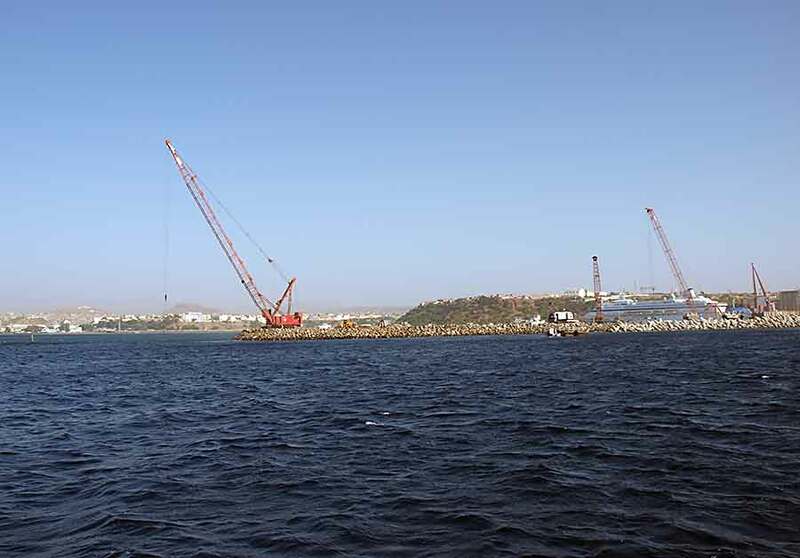 We also had a good view of the new breakwater which is slowly growing but far from complete. Our passage northward started well, beating along the southeast coast and onward towards Maio island in Force 5 with reefed main and genoa. When we decided to change tack to head northwards between the islands we made only slow progress against the current. The wind dropped to Force 4 and even with full sail we were struggling to make reasonable headway in the lulls. 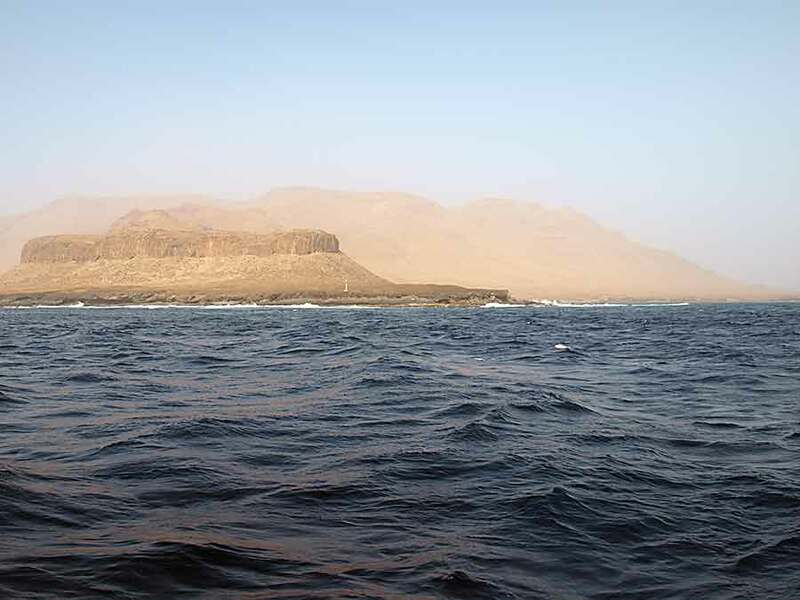 Fortunately, by the evening we were out into open water and the wind veered and strengthened again so we could stay on starboard tack all the way to Sao Nicolau island, arriving late on Thursday afternoon. Uphill sailing in the trade winds is not impossible - 120 miles to windward in 32 hours wasn't bad. We didn't see much of either the east coast of Santiago or Maio as visibility was very poor, because of red Sahara dust in the air. (We didn't see any other shipping either.) The mountains of Sao Nicholau were only visible when we got to about 2 miles off - and Lynn Rival was once-again covered in red dust. We were wishing for a tropical rainstorm to clear the air. Sao Nicholau's main port is Tarrafal (not to be confused with the Tarrafal on Santiago we visited a week earlier), a village with a breakwater that has seen considerable growth over the last 20 years. We first anchored a couple of miles to the northwest of the town, somewhere we could swim in clear water and rest. The anchorage has no name and there's just an orange-painted house ashore. The scenery on this southwest coastline is similar to other islands: barren but with dramatic, deep gorges cutting into the mountains. The winds were light and the tidal streams quite strong so we drifted back and forth to our main anchor, which held well throughout. We were rolling a bit, but not uncomfortably so. The following afternoon we moved to the anchorage off the town beach where there were a few other yachts, and a Dutch-registered barquentine. Again we lay to just our main anchor, drifting back and forth with the tide quite comfortably - as everyone else seemed to be doing. On Saturday morning we rowed ashore, locking our dinghy to the trailer of a fishing boat parked on the beach. We refused the demands of children for payment to 'watch dinghy'. (We don't like to encourage children to become protection racketeers.) The fish market was busy but the rest of the town quite quiet. 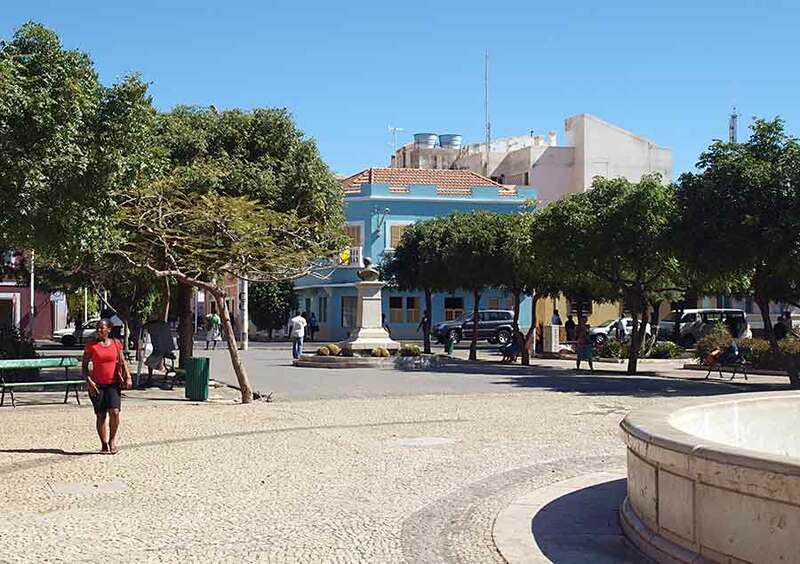 We walked to the main square and hired an "aluguer" - the pick-up trucks that serve as minibuses, taxis and general wheels for hire - to take us to Vila de Ribeira Brava, the capital of Sao Nicholau. 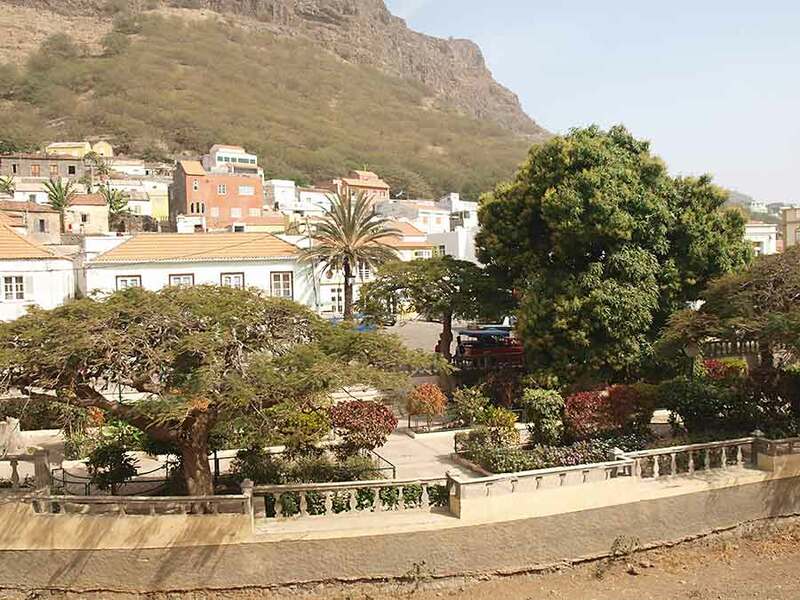 The road climbs up through the barren landscape of the south part of the island and around the island's highest mountain towards the north coast, passing through scenic valleys where the islanders grow a wide variety of fruits and vegetables. The road is modern so doesn't have the same charm of the old cobbled road that crosses Santo Antao but much of the scenery is stunning. We admired the famous dragon trees and hillsides covered in yucca plants. We saw men cutting down the flower stalks of the yuccas, apparently to use them to make huts for animals. 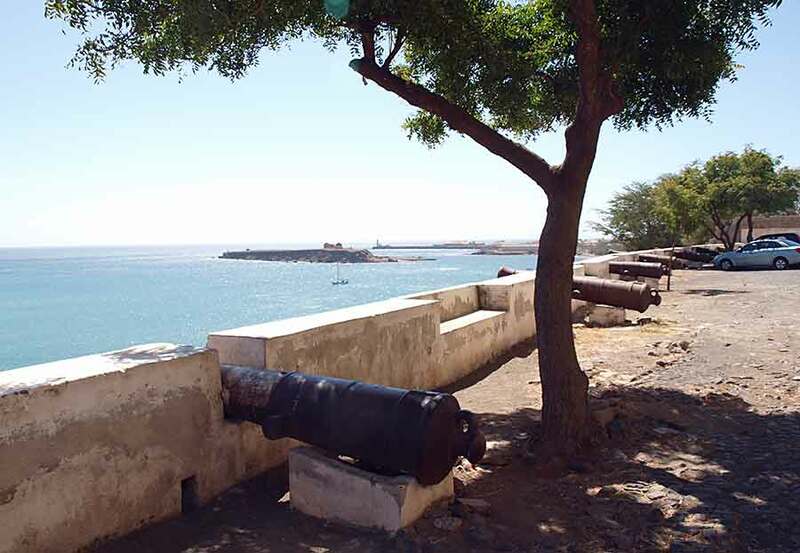 Vila de Ribeira Brava is approached from the north coast and is hidden away in the middle of the island to avoid pirate attack, with narrow, tidy streets - both charming and very quiet. Apart from a few carnival t-shirts for sale, there were few signs of the forthcoming festival. The capital was once a seat of learning; perhaps a training school for formal gardeners? The visit inland made a lovely excursion but unfortunately the haze made the scenery appear less spectacular than it undoubtedly is. The whole island has a friendly, cosy feel to it, with everybody apparently knowing everyone else. Our driver was constantly hooting his horn and greeting friends as we passed through the villages. Returning to Tarrafal we found a restaurant and ordered "fish" for lunch. We waited a long time over beers but then were rewarded with the most delicious red grouper cooked in a garlic and tomato sauce, with a massive plate of chips and another of rice. The restaurant wasn't very busy, apart from a group of men watching Cape Verde play a match in the Africa Cup of Nations. After lunch we weighed anchor and went back to "orange house anchorage" so we could swim. The water near the town was mucky and we were feeling the need for a cooling dip. The winds were still light and the temperature rising to the high 20s. Since leaving Mindelo we've been hoping to see more wildlife and catch some fish. So far we've not been very successful although we have seen some interesting seabirds, perhaps Frigate and Tropicbirds, especially along the steep cliffs on the west coast of Santiago and around Tarrafal. We have also 'caught' a few more flying fish; one even managed to fly into the mainsail cover and escape notice until well dessicated! 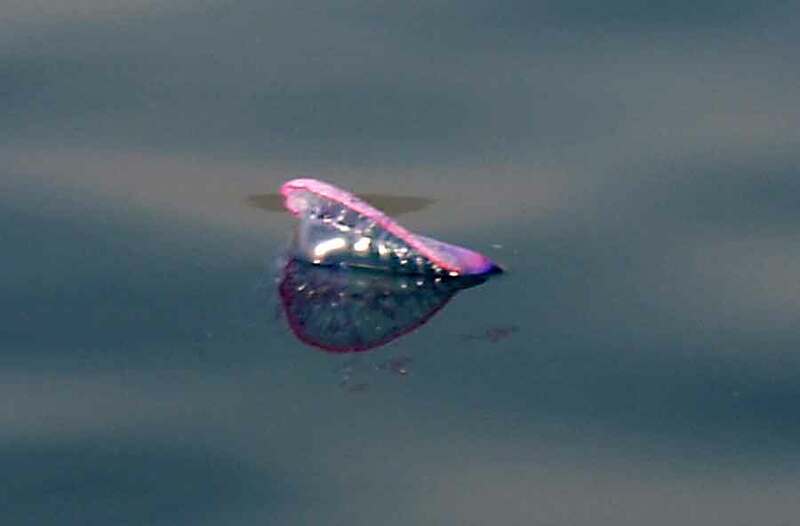 On the way to the anchorage we also saw what looked like floating debris in the water. Only after we anchored and were preparing to jump off the side of the boat did we realise they were jellyfish - and hundreds of them! It rained later but not enough to wash down the decks or us. We left Sao Nicholau on Sunday after changing the oil in the engine. It's hard to believe that we've motored 140 hours since launching but we have (and covered over 3,400 miles). The wind was gusting strongly off the hills but we expected it to drop once we reached the west end of the island so we hoisted the full main for the 23 mile passage to the next island, Santa Luzia. Two miles later we realised the Force 6 was here to stay so we put in two reefs and unfurled the staysail. Visibility was again bad and we hardly saw Ilheu Branco, a bird sanctuary, as we sailed passed on our way to the anchorage on the southwest side of Santa Luzia. 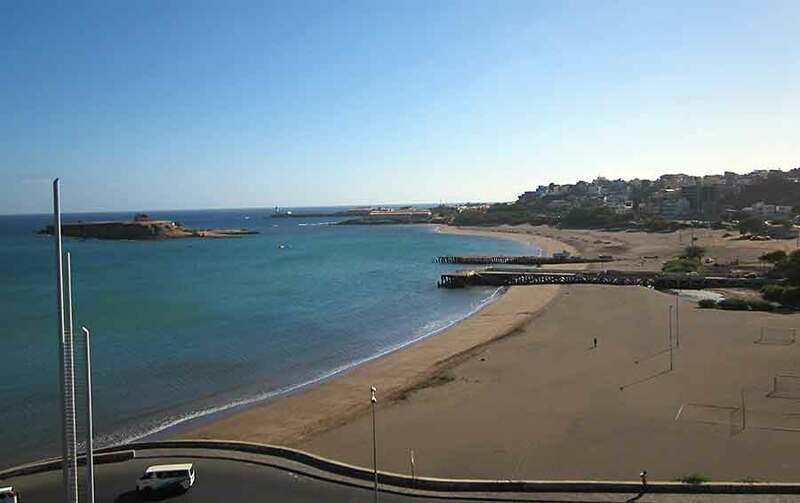 Santa Luzia is barren and uninhabited but it has a beautiful, almost white, sandy beach along this coast. The wind was howling down the hills as we dropped anchor but the holding was good and we had a fairly comfortable night there. The only disturbance was the alarm on our new depth sounder beeping occasionally for no obvious reason. We've yet to work out why; perhaps a big fish was swimming below us. The wind was still howling in the morning and the surf stopped us even considering going ashore. 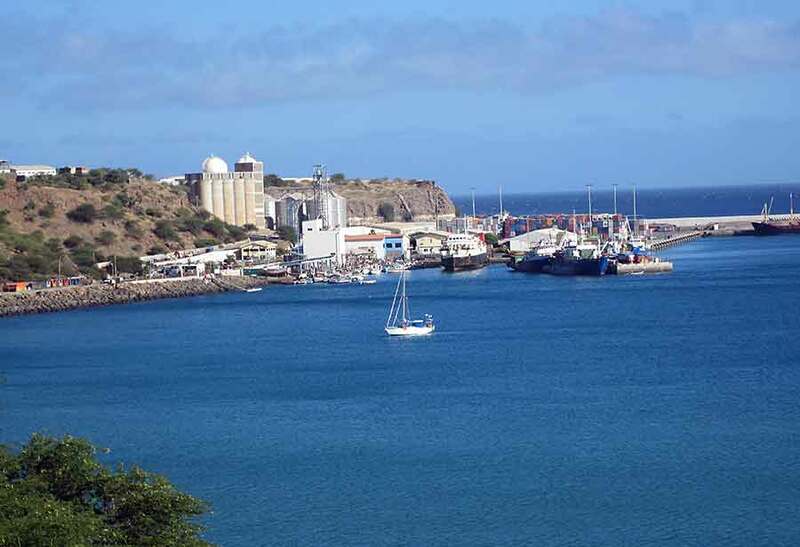 We weighed anchor and had a good sail in Force 5 through the Canal de Santa Luzia, the tide running with us, reaching Mindelo by mid-afternoon.